Presumably from a series of 12 yakusha-e (actors’ portraits), each with a haiku by Masanobu Probably the same scene as in cat. 13: a pair of young actors is walking by a brothel in black lacquered geta, the theme is the story of the beautiful young singer Kantō Koroku, as can be seen by the names included in Jihei’s print. Probably from an album of literary travesties, in which topics of classical literature are parodistically “disguised”. In front of a house situated by a winding watercourse, a young couple are walking on high, black-painted geta. 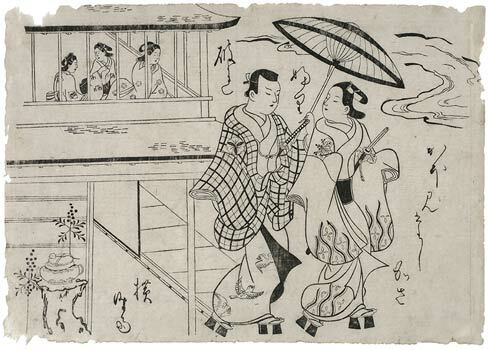 The young man with unshaven head (tategami – standing hair) is thoughtful holding an open umbrella over his graceful companion. He has casually slung a checked haori over his dark-lined kimono decorated with sparrows. One hand is tucked away under his sleeve. A sword is fastened in his belt. On his sleeve the mon of the actor Matsumoto Kōshiro I can be identified. His companion, a person in elegant, feminine attire with long swaying sleeves turns towards him while walking, with a somewhat condescending expression, both hands hidden under broad kimono sleeves. Wavy lines with inserted four-petaled ornaments are the only form of decoration on the robe. On the shoulders, the mon of the onnagata actor Ogino Sawanojō can be seen, a kiri leaf with blossoms. The person attired in woman’s clothing, with a highly fashionable hairstyle, is revealed on closer inspection to be a young man. The bald shaved patch on his head, a sign of masculine maturity (gempuku), is half hidden under thick locks of hair. A sword is fastened in his obi. The actor of the wakashū can be identified by his mon as Matsumoto Kōshirō I (1674-1730), who was one of the most important tachiyaku of his time. The onnagata Ohino Sawanojō (1656-1704) was one of the masters of his craft. From the eighties he appeared in Osaka, performed in Kyoto, then in Edo, where he often played opposite Danjūrō I. He was an exceptionally handsome man, his elocution was superb, and he was also a talented dancer. He especially excelled in love scenes (nuregoto). He was also famous for his interpretation of the roles in the Keisei world. Just hoe „unique” (zuiichi) he appeared to his contemporaries in Japan can be seen from a critic’s remark on his performance: „That would even astonish a god or Buddha.” Another time it was said that „his way of moving could kill“, or „his appearance cuts the life of others short.” Sawanojō retired from the stage in 1698 and began trading in oil, but a year later he was acting again. After a guest appearance in Kyoto he played in Edo (Tokyo) until his death. The theme of the print under discussion here is the story of the young man Kantō Koroku („The small six from the Kantō area“), who is supposed to have been a ballad singer from West Japan. He lived in Akasala in Edo and performed his ko-uta (folk songs) there. According to others he was a jōruri singer. His unusual beauty seems to have made a special impression on his contemporaries of the Keichō Era (1596-1615). A woodblock print dated to ca. 1680 and attributed to either Sugimura Jihei or Hishikawa Morofusa shows the scenery and the persona of our print with accompanying role identification. The handsome youth is given the name Kantō Koroku; his companion is named as Ukiyo-no-suke („The helper of the floating world“). In our version only two girls instead of the three are depicted, of whom one bears the name Miyako-no-Okuni. In a cartouche the title of the scene also appears: Yoshida Kukai-dō („The way of bitter experience to Yoshida“). The scene, which is similar to that in our picture, is set in front of a brothel on the thirty-fifth station of the Tōkaidō, Yoshida, today called Toyohashimachi. The river flowing past the house in our version is the Toyohashi River. Koroku is also the hero of a Kabuki-Kyōgen (comedy) towards the end of the 17th c. Torii Kiyonobu I depicted the singer with Danjūrō I as early as 1698; in 1699 a play with the title „Kantō, Koroku and Brocade from an Old Village“ (Kantō, Koroku furui sato no nishiki) was performed at the Murayama-za in Edo. In Kyoto the popular portrayer of lovers Nakamura Shichisaburō interpreted the role of the handsome young man; but he first won public acclaim after his return to Edo to the Yamamura-za. In our view, the woodblock print under discussion here represents a travesty of the theme which we can attribute with some confidence to Masanobu. The leaf probably comes from an album of literary travesties; one such album, which has been preserved in the Buckingham Collection, Chicago, is remarkably similar both stylistically and thematically. The twelve leaves of this series entitled Yamato Irotake dating from 1705, illustrate various themes of classical Japanese literature in a parodying manner and are based on Kabuki and puppet theatre plays (jōruri). Many famous actors of the time make an appearance, but they are not ascribed to identifiable roles and plays as was usual, but are randomly associated with characters from literature. The composition and the rhythm of the lines in our woodblock and in the leaves of this series are similar. As in the print discussed here, the curving lines of the clothing are of flowing gentleness. The straight, geometric lines of the architecture provide a strong contrast to these artistically flowing lines. The black areas provide rhythmic accents of musical charm. The proportions of the figures relative to their surroundings is also the same. The ornamentation on the clothes in our picture is also found on the robes of the Irotake series. The kimono of a man on page one is decorated with a finely drawn Genji mon. The sparse wave decoration of the kimono of Kantō Koroku is repeated on leaf three, while the eye-catching checked pattern appears on the clothes of a comic dancer on page twelve. The mon of the onnagata performer Ogino Sawanojō. The artist evokes further associations by means of the poem. The topos of the young woman, who is protected by her partner with an umbrella, is known from literature as ama-goi Komachi („The poetess Komachi praying for rain“). In the year 866 Komachi succeeded in calling forth rainfall after a long period of drought, by reciting a poem in a loud voice. It is to this that the poem used in the woodblock print refers. Since the onnagata actor in our woodblock print fails to appear in the costume of a particular role, but instead as a handsome youth in woman’s clothing, this may reveal a possible relationship between the two actors. A further print is to be found in the Pins.Collection, Tel Aviv, (1980), no. 66.